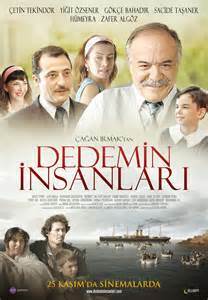 This Turkish film is a popular drama about the ethnic Turks, who had lived for generations in Greece, who were forced to migrate to Turkey during the population exchange at the end of the WW I. It is somewhat the reverse story that is told in the Greek movie, “Politiki Kousina” (“A Touch of Spice”). When Grandfather was just seven years old his family was displaced from Crete to mainland Turkey. Here the family is not fully accepted because they are considered to be Greeks. Yet in Greece they were considered Turks. The Grandpa’s greatest desire is to see the land of his birth before he dies. It is this longing that makes him frequently drop bottles containing letters into the Aegean. The lack of acceptance in the village is particularly hard on the young grandson who acts out. In the light of the current refugee situation in Greece, it is helpful to once again hear this story of when both Greek people and Turkish people were forced to leave the land of their origins – millions of them. Through these population exchanges, people experience what it means to be “the other”. In Turkish, Greek, and some English with English subtitles. 126 minutes. Little England is Greek period drama/romance that takes place on the island of Andros, where 20-year-old Orsa and her younger sister, Moscha, live. Orsa is deeply in love with Spyros Matabes, a lieutenant, but she has never revealed her secret to anybody. On the other hand, Moscha dreams of leaving Andros and escaping women’s fate of marrying sailors, who are usually away from their families. Their mother, Mina, is married to a sea captain who has been away for years, considers marrying for love to be trouble. Over-riding her daughter’s emotions, she wants them to make wealthy marriages. Once married the two sisters share a double home built for them – and the house becomes even more divided as a forbidden love festers. Little England dominated the 2014 Hellenic Film Academy Awards, where it received 13 nominations and won six awards, including that for Best Film. It was the official submission by Greece to the Best Foreign Language film category of the 87th Academy Awards 2015, but it was not nominated. 132 minutes. In Greek with English Subtitles. This movie directed by Jean Negulesco in 1957, was shot on location on the Saronic Islands, notably Hydra, Locale shots of Athens, Rhodes and Delos in the 1950s are also included and make it all worthwhile. One scene utilizes the Eastern Orthodox monastery complex at Meteora. All-time Hollywood and international movie stars Alan Ladd, Clifton Webb, and Sophia Loren are the leads in the movie. Loren plays Phaedra; a poor sponge diver lives on the lovely Greek isle of Hydra, while diving, she discovers and ancient brass and gold statue of a boy riding a dolphin, which is said to have the magical power to grant wishes. Her shiftless boyfriend wants to sell it to an unscrupulous art collector. Jim Calder (Ladd) wants to return it to the Greek government. What will Phaedra do?